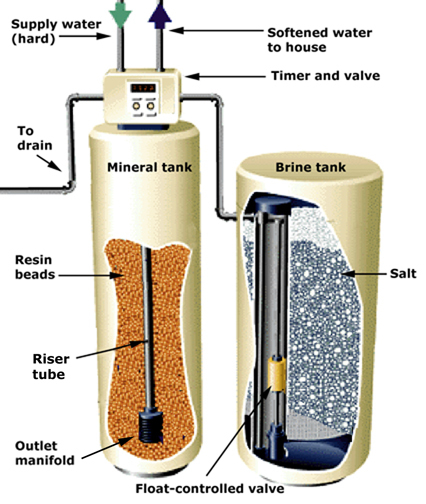 softeners systems in both residential and commercial buildings. We can install a system that will be designed specifically for your needs. Hard water is a buildup of minerals in the water supply. such as washing machines, dishwashers, faucets and other fixtures. The best way to remove hardness from the water is with a water softener. which makes up the total hardness in your water, for sodium or potassium ions. This process results in softened water which is more desirable for home use. magnesium ions, or hardness, in exchange for the sodium ions. Eventually the resin beads become saturated with mineral ions and have to be "re-charged". This process is called regeneration, and is conducted by the control valve on the top of the tank. The control valve is the brains of the system. beads in a stream of sodium ions which replace the accumulated calcium and magnesium ions. Softened water is delivered through out your home. the drain by fresh water. The regenerated resin beads can be used again and again. Soft water extends appliance life and can reduce energy costs. harder, consume more energy and ultimately lead to a shorter life span—costing you more money. For example, water heaters last up to 50% longer and consume up to 29% less energy. time to call Harry Caswell Plumbing, Mechanical and Utility Contractor !